Aerating our turf is an important part of maintaining the golf course. There are three main reasons why we aerate. The first is to relieve compaction. Relieving compaction makes the soil softer and allows for easier movement of water, nutrients, and root growth. Certain weeds, such as goose grass also thrive in compacted soils. The second reason is to allow air into the soil profile. While water is important for root health, the roots also need air to thrive. Roots can rot out and be susceptible to certain diseases if excessive moisture persists. The third reason we aerate is physical removal of thatch. Thatch is a natural layer of organic material that exists because of the natural life cycle of the plant. While a thin layer of thatch is desired to help cushion the crowns of the plants and make the turf softer, excessive thatch can cause a myriad of problems. 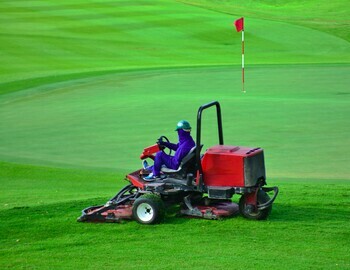 While aeration can be time consuming and a little messy, it is vital to maintain a healthy golf course. Healthy grass begins with healthy roots, and healthy roots begin with healthy soils!